Here are the top 10 tourist attractions in Dhaka. Dhaka is not only the capital city of Bangladesh but a residence of 18 million populations as well. As it’s one of the most densely populated cities in the world full of activities, it’s a paradise for street photography. That’s why Dhaka is your city if you like street or portrait photography. Also, in order to shoot for several days, you’ll find unlimited choices. And you’ll find some of the must visiting tourist attractions in Dhaka which you should not miss while visiting Bangladesh in this article. You might be interested in checking our Old Dhaka Tour, which is our most popular city tour in Dhaka if you’re interested in visiting them on a single day. Apart from these, Dhaka boasts of a rich cultural heritage seen in its ancient architecture such as Ahsan Manzil, Krishna Temple, and Lalbagh Fort. What are the Top 10 Tourist Attractions in Dhaka? In addition of the rich cultural heritage, there is also a park and shopping mall culture like in India where people hang out in parks and malls and one can also take part in these activities for a local experience. Also, it’s a colorful and thriving metropolis, which is known as the city of mosques, muslin, and colorful rickshaws. As the Moghul viceroy of Bengal founded the city in 1608 AD, Dhaka has attracted travelers from around the world for centuries. Although today Dhaka boasts modern architecture, it’s still bearing vestiges of its exciting past. Well, let’s know what the top 10 tourist attractions in Dhaka are. 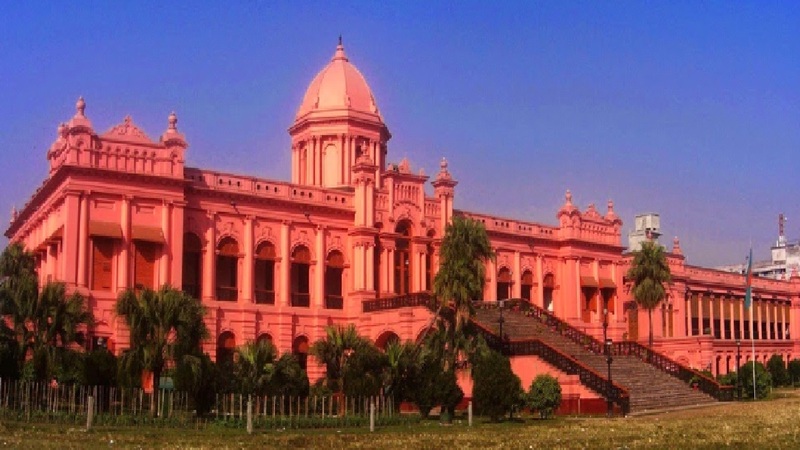 The first and foremost as one of the tourist attractions in Dhaka is the beautiful pink palace with a rich history is Ahsan Manzil. When it was built by Nawab Abdul Ghani who was Dhaka’s wealthiest landowner at the time, it dates from 1872. But, the palace was destroyed by a tornado, nearly two decades later. Although it was reconstructed by Lord Curzon, almost went to oblivion after his demise. And finally, Ahsan Manzil was thoroughly restored to glory in the late 1980s. The scenery of the manzil area is glamorous that charm a lot of visitors every day. Also, there are various family portraits and the skull of Nawab’s favorite elephant is on display for those who in seek of history. It’s the Jatiya Sangsad or the National Assembly Building is one of the tourist attractions in Dhaka with the finest landmark. As the building has a huge assembly of rectangular boxes and concrete, its sliced open with bold triangular apertures in place of windows. As per the building’s entry requirements, be sure to book for a guided tour of the National Assembly early in advance. Also, as a foreigner, you’ll need to provide two copies of your visa and passport before entering the building. Locating on the southern part of Dhaka on River Buringanga, Sadarghat River Front is a busy port. Hop onto a boat to get fascinating views of the river and the surrounding area from the port. Also, there are the English speaking boatmen who will be more than happy to give you a guided tour of the area. You’ll notice small children on the foreshores casting homemade nets into the river when you get to the shore. And you’ll spot repairmen busy with their tools working on ship hulls within small distance after the shore. If any visitor wants a perfect city break then Lalbagh Fort is the perfect city break for Dhaka travelers. The construction of the fort was started in 1677 by Mughal Subahdar Muhammad Azam and his successor, Shaista Khan continued with its construction by ceased due to the demise of his daughter Pari Bibi. Although the fort is not completed entirely, three architectural monuments within the fort were completed. And those are the three domed Quilla Mosque, Diwan, and Mausoleum of Pari Bibi. As it’s a ruined area near Dhaka, it gives an idea of the Islamic culture and Islamic heritage of the country. Although literally meaning the City or Village of Gold, the area offers travelers the chance to experience countryside near Dhaka and archaeology and adventure. When you’re there, you’ll find mosques and also ruined gorgeous mansions like Raj baris or palatial buildings. Apart from these, there is also a pond around the small village and an interesting museum of local folk art. Typical of the war museum in Cambodia about ethnic genocide, the museum commemorates the liberation war of Bangladesh and independence of the country from Pakistan and can be quite graphic with skulls and bones. Besides the presence of a tea stall and bookshop for the liberation history of the country, cultural events are also held at the museum. As this is an architectural wonder in the city of Dhaka, it gives an idea of the lifestyle of the Nawabs or Muslim rulers of the city and country. Although it’s the official residence of the Nawabs of the country and the palace was destroyed by a tornado, it has been restored and is now a museum displaying photos, portraits and Islamic history of the country. Also, it was the living of the British ruler Lord Curzon is that occurs on the site of a former French factory. Making the palace one of the popular tourist attractions in Dhaka, the palace has been constructed in the revivalist mode of architecture and is painted pink and designated as a national museum. It has been declared a national monument in the country as this temple for Hindu Goddess Dhakeshwari or Durga popular for the Durga Puja in West Bengal. After the destruction of a similar Kali temple in the city by the Pakistan army, the temple has assumed significance in the country. And now it holds sociocultural activities, including the popular Durga Puja etc. It has been constructed by Mughal architect Shaista Khan with seven large round domes and is a wonderful and peaceful setting so it calls ‘Sat (seven)’ domed mosque, which is the finest specimen of Islamic culture and religion of the country.